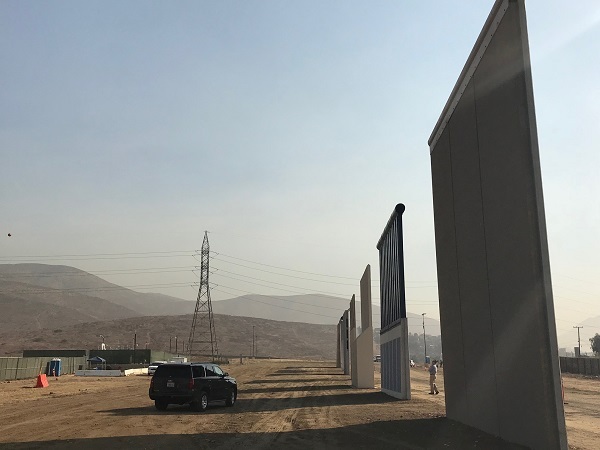 SAN DIEGO (CN) – Eight towering prototypes of President Donald Trump’s promised border wall took shape in a dusty, remote corner of San Diego County this week, but they’ve yet to pass a rigorous test to determine if they will deter unauthorized border crossings. 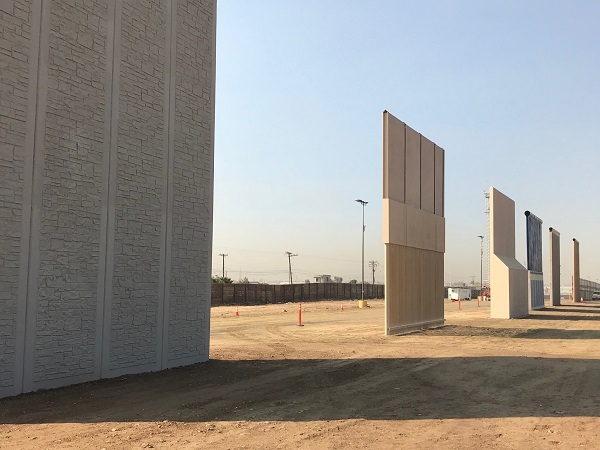 The 30-foot border wall prototypes – some solid concrete walls, others made of other materials – were completed in just one month in the Otay Mesa region in southeast San Diego, a stones’ throw from the U.S.-Mexico border. Courthouse News toured the prototype site Friday with U.S. Border Patrol San Diego Sector spokeswoman Tekae Michael, who pointed out primary and secondary fences currently in place in San Diego have stopped many unauthorized crossings: down to less than 30,000 in 2016 from a high of nearly 630,000 in the 1980s and 1990s. 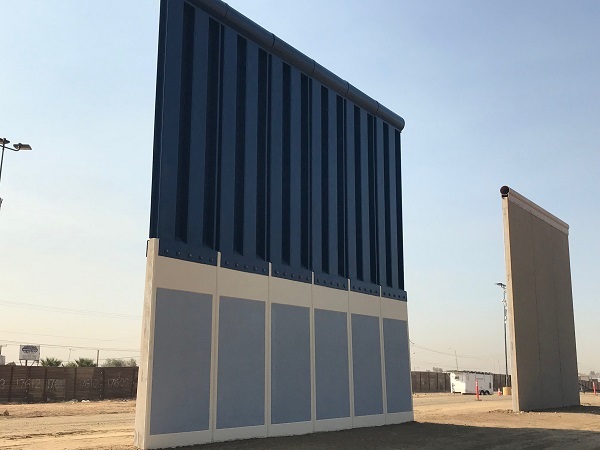 The current prototypes were ordered by Trump just five days after he was sworn into office, when he issued an executive order directing the Department of Homeland Security to immediately take steps to build a border wall along the U.S.-Mexico border, though one or more fences or barriers already exist across much of the 2,000-mile stretch. In San Diego, double and even triple fencing already exists, with a primary 8 to 10-foot fence built in 1991 of repurposed corrugated steel from the Vietnam War and a secondary steel mesh fence added in 1996. Fourteen miles of fencing in San Diego are expected to be replaced sometime next spring, Michael said. Michael said the current fence barriers have mostly deterred vehicle crossings, but that people are still able to get through by cutting holes in the fence. She said San Diego, unlike other states along the U.S.-Mexico border, must deal with water apprehensions from people crossing into U.S. waters via Panga boats. While the prototypes could be between 18 and 30 feet high, all six construction firms that won contracts opted to build their prototypes to the maximum height of 30 feet. The testing phase will begin next month where officials will determine if the walls can withstand climbing, digging, jack hammering and other possible security breaches. 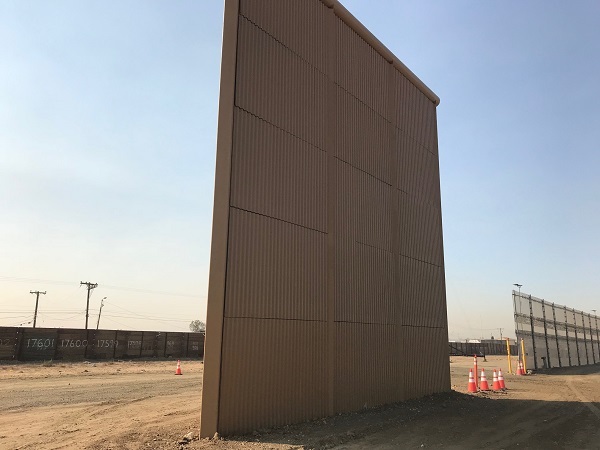 The Trump administration has secured $20 million to build and test the prototypes, but funding has yet to be earmarked for building the wall which is estimated to cost tens of billions of dollars. The prototypes cost $300,000 to $500,000 each to build, according to Michael. While Michael said she was surprised there were no protests at the prototype site over the past month – officials had anticipated large scale protests similar to the Dakota Access Pipeline protests and the San Diego Board of Supervisors had even approved a special weapons ban – the prototype project has not been shepherded through without backlash. Multiple lawsuits have been filed – including one by California Attorney General Xavier Becerra and the California Coastal Commission – over environmental waivers issued by Homeland Security allowing contractors and builders to circumvent 37 environmental laws in order to speed construction of the border wall. Michael said it is not clear how those waivers have been or will be used to build and test prototypes and the construction of the wall, but that Border Patrol has been involved in decades-long litigation over environmental laws related to building infrastructure along the border and has helped mitigate environmental impacts on past projects. There are no hearings scheduled for the environmental waiver lawsuits.